THE looped chains of brilliant colour, the radiating line-work, the grids and vortex patterns -- they speak of a personality, and a strong one. At last, six years after her death, the dazzling Warlpiri artist Lorna Fencer Napurrurla is the subject of a detailed retrospective, a touring exhibition now on view in Adelaide. Another survey show of similar ambition opens next month in Melbourne: it looks back at the brief career of one of most gifted, and most subtle women painters of the southern Pitjantjatjara desert, Tali Tali Pompey, who died recently, but still seems somehow present in the soft-hued contours of the last canvases she left behind. Vanished artists: gathered memories. But what can a standard gallery retrospective truly convey of a desert painter and a traditional life-world? The dilemmas of looking back present a deep puzzle for the indigenous art establishment, as it deals with the deaths of its great stars, and the urgent need to define and frame their hectic careers. During the first phase of the desert art movement there was a distinct preference for group exhibitions: as a result the individual personalities of artists were little scrutinised. Comprehensive shows examining the life and output of a single painter were hardly ever staged. The shift towards monographic surveys came only in the 1990s with the evolution of a coherent market, committed connoisseurs, keen collectors and an increasingly vibrant auction trade. Rising value produced an appetite for art made by well-known figures: in turn, painters accentuated their individual styles, and they gained followings. The names of the most successful became prominent. Soon there were indigenous art celebrities. Inevitably the first great, career-tracing exhibitions came next -- Ginger Riley and Emily Kngwarreye in the mid-90s, Paddy Bedford and Kitty Kantilla in 2007. But these early biographical shows served to delineate a set of problems. The two men, Riley and Bedford, were still living when their retrospectives were held: they could visit the galleries themselves, their personalities were very much to the fore, the exhibitions were triumphs, not the memorials they seem in retrospect. Triumphs, though, that relied heavily on the presence of the artist to lend them immediacy and force. In the case of the exhibitions devoted to Kngwarreye and Kantilla, both the women were dead. It was quite unclear how best to capture the essence of the artists. The culture that produced them seemed to hover beyond the bounds of comprehension. There was simply no easy way to tie together recollections of the painters in life and the display of their assembled works. The strain of distance between the maker of a piece of tradition-based indigenous art and the buyer or admirer of it is only magnified by the boundary of death. How to appraise the founding generation of masters from the desert, when so little about their inner lives is securely established, and their own families are inclined to offer up such scant information to the outside world? The two current exhibitions, both cast as tributes, approach this dilemma in different ways. The Lorna Fencer show, staged by the Northern Territory government's art touring arm, and now hanging at the Flinders University Art Museum, aims at a full career history: the Tali Tali Pompey show, to be held at Mossenson Galleries, highlights instead a tight selection of the painter's final works. Lorna Fencer is presented through the reminiscences of various art advisers and curators who knew her and seek to provide a picture of her personality; Tali Tali is viewed purely through the prism of her serene, light-filled art. Fencer was a volcanic figure; Pompey a person of some reticence in the company of outsiders. Both, though, were sublime painters, in their distinctive ways. When the expert consensus is in, decades from now, it seems likely "Yulyurlu" Lorna Fencer's place as one of the great masters of the initial desert painting explosion will be secure. She made a great deal of work, for many kinds of outlets, and it was of mixed quality: but at its best it had a tense energy and grace that seemed expressive both of her Warlpiri identity and her individual character. She was capable of great originality within a fixed template of themes and symbols. She poured out her art in different forms; not just canvases, but etchings, painted digging sticks and yam roots and coolamons. The slightly hit-and-miss nature of her work is plain in the exhibition: large, fully realised pieces of expressionist ferocity sit beside cramped, crossed and dotted squares of paint. But the sinuous lines of her yam and water dreaming pieces and her sure touch with vivid colour set her apart from other women artists of the northwest desert: for all the exhibition catalogue's attempts to tell the viewer who she was, it is the work that proclaims her nature best. Tali Tali Pompey's artistry was of a more gentle, understated stamp. It relied heavily on rhythm and reduplication, it was an art of the sandhill country that she knew well. The country that inspired her charming name, for a "tali" is a sand dune in the various languages of the western desert. Her path through life was typical of a contact-era woman of the Centre: early mission days, marriage, many children, work, a spell at the Ernabella craft workshop: then a late flowering in paint. But her sharp gift for catching her surrounds in pattern stood out even in the boom days of desert art when her first pieces went out into the wider world. The paintings gathered in the Melbourne show display grand works in her late style: roundels and arcs in pastel shades that seem to speak of sunset; sharp sandhill lines that stretch out as if mirroring the bush landscape's scale. There is a focus on form in them. All that is inessential has been stripped away: the lines and joins in things remain. And so it was in a poignant early work of hers that brought her keen attention when it was hung, a decade ago, in the National Aboriginal and Torres Strait Islander Art Award in Darwin. It was a simple sketch, acrylic on paper: to the outside eye, it looked like a pattern of symbolic lines, a grid around a waterhole: it was actually a precise rendition of the slats and supports on a mission bed. A quiet observing eye: a strong sense of self. But can these features of her life and work come through in an exhibition held so far from the world she inhabited, across so many divides: linguistic, social, economic and cultural? Retrospectives of the kind now being held in memory of these two artists in Adelaide and Melbourne seek to bring them back, to collect their achievements, to present them to the viewer whole and clear. But every retrospective of a desert artist from the foundation era of the movement has a deeper tone than the standard overviews we know so well of a western painter's life. 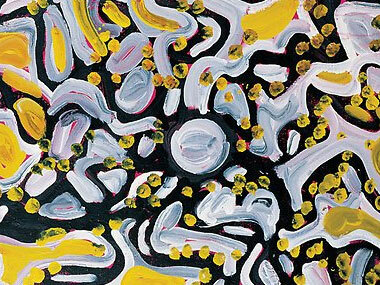 These retrospectives are gazing back to a time when the painting movement in remote Aboriginal communities was in its first flush, and new styles and groups of symbols were being set down on canvas with each passing month. They look back to a period when the last bush-born artists were in their prime: and such exhibitions are steeped in a quality of nostalgia: they aim to preserve, as much as to commemorate. It is impossible, through the distorting lens of fine art, to know an artist with immediacy: art's function is to abstract the making self, more than to pin it down, and this alchemy is a feature of the desert just as much as of the modern city. When the viewer stares at the work from so great a distance, the individual behind the work is yet more removed. The work's essence, the aspect in it that strikes through and speaks down time gains a clearer force. The retrospective has always been a genre for setting lives in context, bringing a life in art closer even as time's flow escorts that life away. It recalls the artist, but makes clear how little in the life explains the work that stays behind. An intriguing lesson to see confirmed in these two exhibitions, full, as they are of emotions, and devoted to the memory of departed friends.